Mazliah Tal (b. 1961, Israel) Lives and works in Kfar Aza. Graduate of the Kalisher College of Art, Tel Aviv. 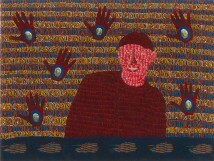 Exhibited solo exhibitions at Tel Aviv Museum of Art, Herzliya Museum of Contemporary Art and Alon Segev Gallery, Tel Aviv. Recipient of many awards including the 2002 Art and Design Prize, Israel Ministry of Science, Art and Sport and the 2009 Rappaport Prize for an Established Israeli Artist, Tel Aviv Museum of Art.